Listen to this track by gravel-throated singer-songwriter and consummate storytelling force of nature Tom Waits. It’s “Alice”, as taken from the self-same 2002 album of the same name, Alice. The track is a wintry tale of love and obsession, and ultimately of destruction too, all set to the kind of late-night jazz sound for which Waits had become known many years before in the 1970s, and to which this track is arguably something of a return. The record is the result of a theatrical production that Waits, and his wife and collaborator Kathleen Brennan, had worked on with playwright Robert Wilson. It was a stage production based on the supposed relationship between Alice Liddel and Lewis Carroll, who would eventually write Alice in Wonderland and Through The Looking-Glass, with Liddel as his muse. But, how does what Lewis Carroll’s muse inspired translate into Tom Waits’ song, and the album on which it’s the opening track? In this song, we see that having a muse can lead to poetry and beauty, but can also lead to obsession and death, falling through metaphorical ice while thinking upon a name too resolutely. That’s a pretty universal theme: the treachery of love. It’s prime territory for songwriting, and for telling stories in general. Luckily, this song was a part of two streams of storytelling, working through three different artists: Tom Waits, Kathleen Brennan, and Robert Wilson, the latter of whom would add a visual aspect to the proceedings by making the song a part of a stage production. The Alice soundtrack spans lounge jazz, ragtime, Weimar cabaret, tin pan alley, old-timey hymnals, discordant avant-garde, and a unique brand of broken-baroque, helped along by the use of vintage instruments. Waits evolved his sound with a significant contribution from his wife and regular collaborative partner, Kathleen Brennan whom he met in 1980 on the set of the film One From The Heart, a project in which both artists were independently involved. Robert Wilson’s Alice stage production debuted in Hamburg Germany in 1992, featuring Waits’ songs as the soundtrack. This kind of project had been tackled before by Waits and Brennan on the Black Rider in 1990, also created as a collaboration with Robert Wilson, and writer William S. Burroughs. Those songs also were eventually released as an album in 1993. The music for Alice therefore had been around for some years in demo form as well. But this time, it took a while before the songs transfered from one medium to another. 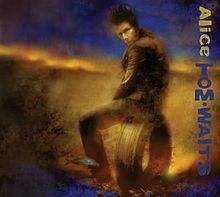 In 2002, the music from the Alice stage production was finally released as a bona fide album at the same time as another album of Waits’; Blood Money, which is also based on a theatrical project of Robert Wilson’s. The songs on each record both deal in a common vocabularly of darkness and light being held in balance; love, obsession, fragility, humour, madness, beauty, and death. This balance is held between the two albums and between the songs on each. But, that tension can also be found within each individual song, like this one. That’s the strength of Waits as a writer and as a performer. He’s able to take the tenderness of love and match it with the finality of violence and death. With “Alice” you get them all in one package. It helps too that Waits is a consummate storyteller who is able to climb into the characters, and give them a voice. This too is what makes “Alice” both tender and frightening all in one artistic stroke. It’s no wonder that he is able to span the gap between songwriting, acting, and theatre soundtracking so successfully. In the end, it’s all about telling a story. And Waits is one of the greatest in his field, regardless of the medium. Tom Waits has a new record out called Bad As Me, his first since 2004’s Real Gone. Check out the hilarious private listening party video for Bad As Me. To find out more about his songwriting process, read this interview with Tom Waits in the Wall Street Journal. What a beautiful track! I’d never heard it before, probably because I’m a little guarded about investing too much in Tom Waits’ music. In my advancing years, I don’t think I have the same adventurousness with my listening … penetrating the angular, cacophonous musical landscape of the vast majority of his stuff. I remain a devout fan of his early efforts, his storytelling (have you ever heard his VH1 Storytellers tracks?) and later gems like this one. He is a true original, a great lyricist, an innovator. Maybe one of these days, when I finish my novel, I will undertake to tackle the Waits canon and find something I haven’t been able to appreciate before. There are a number of gems to be found in his Swordfishtrombones and onward material. He is an artist who follows his muse. I think connecting his interest in storytelling, and in drama as well, really helps to lend perspective on his music, which can be a little alienating otherwise, admittedly. I’m a relative newbie, myself. But, this track is so multifaceted, one of my favourites of his more recent period. Cheers for comments, as always! Most post-Rain Dogs Waits is a chore to sit through for me – thanks for the eye-opener, Rob – never gave this album a chance.